This is a lovely little story about teaching charity to children. 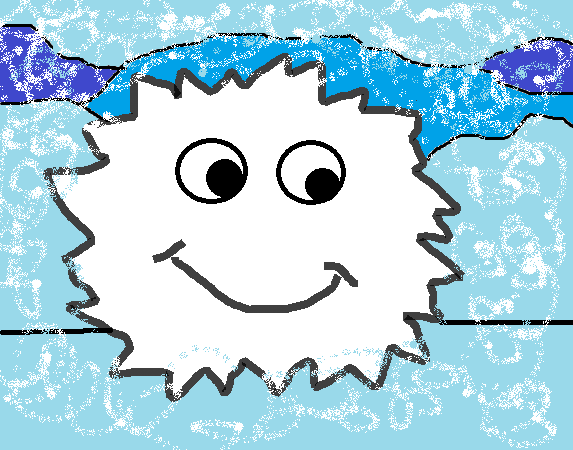 Once upon a time there was a snowflake who lived on top of a tall mountain with all her snowflake friends and family. It was cold on top of the mountain and Snowflake and her family lived happily, creating a beautiful winter wonderland together in a blanket of pure, white snow. People from all over came to the top of the mountain to enjoy the lovely snow. They often commented on how beautiful the winter wonderland looked with all the snowflakes binding together to make the glistening snow. One day a little boy came up to the top of the mountain from the village below. He was dressed in a dirty and torn winter coat. The little boy brought a rusty old sled made out of a piece of a tin roof and played in the snow. It made the snowflakes giggle because the rusty old sled tickled them as the boy slid down the mountain. When it was time for the boy to go home Snowflake overheard him say sadly that he wished it would snow in the village. He said that it would make his old and very sick grandfather smile if he could only see the snow one last time from his bedroom window. That night as the sun went down below the mountain, Snowflake thought about what the poor little boy had wished for. She talked to the other snowflakes on the mountain about the little boy and his sick grandfather. She explained that his grandfather wanted to see snow in the village one last time. All the other snowflakes wanted to play and just said they did not want to go down to the village for an old sick grandfather. Snowflake became discouraged and was sad that she could not bring snow to the village below and make the boy and his grandfather happy. “I am only one tiny snowflake and cannot make a difference in the world. One lone snowflake simply cannot create a beautiful winter wonderland,” Snowflake said out loud. That night snowflake was woken up by the Winter Wind. He told Snowflake he had been listening to her wish to bring a winter wonderland to the little boy and the old, sick grandfather in the village. The Winter Wind said he wanted to help Snowflake make a difference in the life of the little boy and his grandfather. “But how can you do that Mr. Winter? How can only one tiny snowflake and a Winter Wind make a winter wonderland?” Snowflake asked. Suddenly, the Winter Wind began to blow all the snowflakes down the mountain. One by one they each flew down the mountain with the wind and landed gently below in the village. That morning, as the sun rose to the top of the mountain, the villagers woke up to a winter wonderland surprise! The snowflakes sparkled as they stuck together creating a beautiful blanket of snow. The little boy and his very sick grandfather looked out the window at the snow. Snowflake could see by their faces that they were so happy to finally see the snow in the village. The other snowflakes danced and played in the village that day. They giggled when the children rode their sleds over them. It did not take long for the snowflakes to realize that when you give happiness to others, you too will also become happy. That is the secret of charity. When you give charity to others you become richer. Sometimes it only takes one little snowflake to dream up a way to get things started to help others.